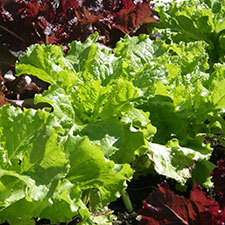 Loose leaf lettuce growing in a high tunnel. Rutgers Cooperative Extension is continuing its Ultra-Niche Crop series in 2017 with the upcoming workshop “High Tunnel Winter Lettuce”. This workshop, the third class in the Ultra-Niche educational series for farmers seeking new crop opportunities, will take place on Tuesday, January 31, 2017 from 5:30 to 8 p.m. The workshop will be held simultaneously in Cape May Court House, Bridgewater and Bordentown, New Jersey. Farmers will learn how to make more money with less land, how to grow, market and sell winter lettuce, and how to make practical decisions on marketing and crop production. There will be a 15-minute “Virtual Field Trip” video on the production and marketing of the crop and a speakers panel of the experts interviewed in the video. Also, participants will be led through worksheets to guide them in determining whether or not growing the crop is right for them, their acreage, and their situation. The speakers panel includes Jess Niederer, 2016 National Outstanding Young Farmer and organic grower at Chickadee Creek Farm, and Meredith Melendez, award winning Rutgers NJAES County Agent and on-farm food safety expert. The cost for this workshop is $20 per person and includes dinner at 5:30 p.m., followed by the program at 6 p.m. Registration is required. To register for this session go to Eventbrite. The deadline to register is January 27, 2017. For more information, contact Jenny Carleo at (609) 465-5115 or email Jennifer Matthews.